I have no plans to continue development of this. I really want to move on to other things. Sonic Redux is the first extensive hack of Sonic R, one of the more obscure entries in the series. The goal of Redux was to be a "Sonic R 2" of sorts, with new planned characters and courses with a focus on making sure the game is balanced and fun. I only ever got to implementing the characters though, and I had a lot of issues doing so, so I'm not sure if I want to continue with this. Now you can play Sonic R in HD (720p, 1080p, you name it)! See those Saturn-era polygons in detail you never thought necessary. But even more importantly, you can play in 16:9 widescreen, giving you a wider view of the racetrack and a less terrible aspect ratio if played fullscreen. Note: this functionality has been ported to the Sonic R Mod Loader. 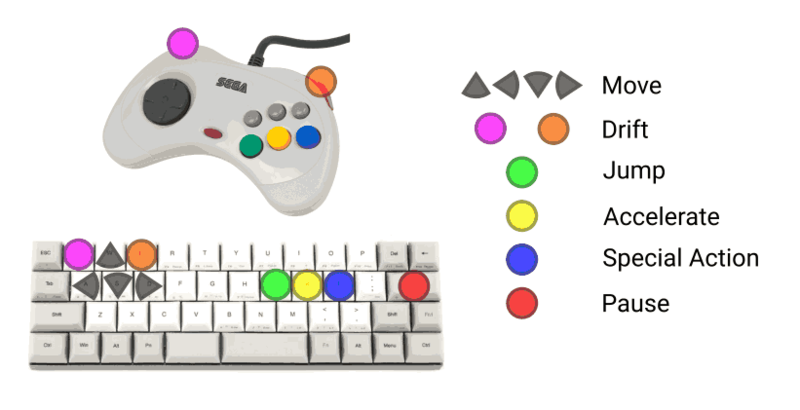 Use the Sonic R Updater to install it onto your vanilla (not Redux!) 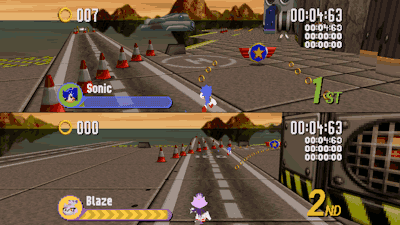 copy of Sonic R.
Various tweaks have been done to make the controls and handling a little bit better. For instance, you can now walk backwards by holding the down key. Turning is also quicker, slopes have more effect on you, and the characters feel like have more weight to them. Ever wanted to plan your racing strategies with the ring gates and accelerators in mind? With a few tweaks here and there, rings are now enabled in time attack mode. Sonic, Tails, Knuckles, Amy, Eggman. They're ALWAYS who you race against in Sonic R. Every single time. ...no more! Because the characters are better balanced, it's now possible to shuffle who appears on the starting line. Every race will be different! Every single character can now jump. Amy's slow noisy car is no more! Instead, the special abilities have been mapped to a new button, the "Action button". See the Characters section for more details. Many character's special abilities are shown on the new Special Meter. This can show how much time you have left in the air, or how much longer you need to wait to use your ability, or it can help you with timing tricky moves. It also shows the number of balloons or Sonic Tokens you've collected. See the Characters section for more details. Sonic Redux comes with 8 brand new racers, complete with (admittedly really unpolished) custom models and special abilities. The fearless hedgehog, always up for some competition. Pressing Action while running he can roll into a ball and zoom down hills at breakneck speed. Holding Action from a standstill will charge up his Super Sonic Spindash, launching him from 0 to super sonic speeds in no time at all. Sonic's best pal, always at his side on his adventures. Press Jump in mid-air to fly through the air for a short period of time, as indicated on the Special Meter. Tails will slowly descend as he flies, but if you hold Action he will rise instead. When the Special Meter is empty Tails will fall! The sole guardian of the Master Emerald on the floating Angel Island. 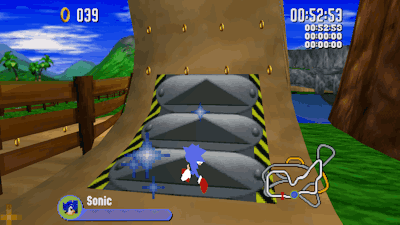 Press Jump while in mid-air to have Knuckles glide, slowly descending until he lands. Sonic's not-so-secret admirer. Subtlety never works, she claims. Jump and press Action to start swinging her hammer. This will reset and start draining the special meter. If she lands while the special meter is not empty, she will bounce off the ground. If you're careful, you can even bounce off of water! Land on ground while meter if full to bounce forwards and gain speed. Land on ground while meter is near empty to bounce upwards and gain height. Lead member of the mercenary group Team Hooligan. His real name is Nack the Weasel, but he thinks that name's not cool enough for him. Get at least 10 rings to fill the boost meter. Press Action when Special Meter is full to fire the cork gun. This will stop others dead in their tracks and cause them to drop 20 rings. This costs 10 rings. Formerly Dr. Robotnik's most menacing threat. Recovered from the aftermath of the Little Planet incident, he's since reprogammed by Tails for training purposes. Don't hold Action to move slowly, but with great control. Hold Action to move very fast with almost no steering. Princess from another dimension. Sometimes she comes over for birthday parties and races, when not busy dealing with her own matters. Hold Action to use her Boost to speed past others. Steering will be more difficult when boosting. When the Special Meter is empty Blaze will be unable to boost! Collect rings and complete laps to refill the Special Meter. He hails from the distant future, but with the power of the elusive Chaos Emeralds he can travel through time. He's a bit of a dweeb, even if he doesn't want to admit it. Hold Action to activate his Psychic Powers. This will preserve his speed, but he will be unable to move. He will still bounce off of walls, however. Hold Action in mid-air or walk off a cliff while your psychic powers are active to hover. Silver will stay at exactly the height he's at. This will drain your Special Meter, but it will be replenished when not hovering.